Unlike the other quadraphonic formats, matrixed recordings can be transferred to other mediums for archiving and other uses. With the advent of the personal computer and the recordable CD, we are now given a chance to actually improve upon what once was thought to be a hopelessly damaged album using some very effective restoration tools. Although there are still a lot of vinyl lovers out there that would argue over transferring their "warm" analog records over to a "harsh" sounding digital format, it really is the best way to go. 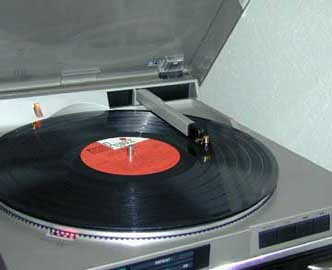 You get the convenience of CD and your vinyl doesn't get worn out from repeated plays. And...you FINALLY get a chance to remove those annoying clicks and pops from years of abuse from a previous owner or that very common bad pressing. I will warn you, it is very easy to go too far with these tools and really mess up the sound. Less is (in this case) usually more. Some of this might seem obvious to some, and over the heads of others. Hopefully, it can be of some help to most. Because I use a PC, I will stick to discussing this format. There is nothing wrong with using a Mac! I edit video on one all day long and they are great machines. My system consists of a home built Pentium II 450 mhz machine with 64 megs of ram. I have used a Pentium 200 and it worked fine, just a little slower. You will need a lot of hard drive space because a single album can take up over 600 megs of space just to record. Then the software will need a work area twice that to use as temporary storage. My preference has always been SCSI drives, but a good IDE drive will work just fine. There is a definite speed difference when you save files to a SCSI drive. The most important single component in your system for restoring these albums is the sound card. Most store bought PC's have really bad sound cards. Because I'm on a budget, I use a SoundBlaster Live! card and have had really good results with it. It has a very low noise floor for a under $200.00 budget card and the PCI interface can move sound in and out simultaneously. There is a huge difference between this and and a SoundBlaster 16. Spend the bucks and upgrade. You will then need a magnetic cartridge turntable and a good phono pre-amp or a receiver that can take a magnet turntable and provide you a line output. It doesn't have to be quad! Run this to the line input of your soundcard, not the mic input! I also picked up a Radio Shack linear turntable from the mid 80's for around 20 bucks. Because of the linear design, the stylus tracks the inner groove(s) better and there is far less distortion than a conventional turntable. This is why the inner portion of an LP can sound harsh and gritty. I did upgrade the cartridge on the turntable, however. One other note...if at all possible, use a cartridge that has good separation and can keep both channels phase relationships accurate. I have done some experimenting with various cartridges and was surprised at some of the results. I thought I would upgrade my basic cartridge with a Audio Technica AT331LP (linear contact) cartridge. I made sure that it was adjusted properly. I started noticing that the Tate seemed to have difficulty holding the sound image properly. Sibilance's would be steered to the right rear channel and things sounded, well...bad. I tried my old Pickering cartridge and the problem disappeared. For grins it put on an old mono record and watched it on the scope. The Pickering kept a straight line between the channels, showing that it was keeping the phase fairly accurate. On the other hand, the AT cartridge image would get wider as the sound increased which told me it couldn't keep some of the information in phase. Long story short, the Tate is extremely sensitive to how the cartridge reacts to phase information. About the only way to check this is with a scope. If you feel like your Tate is steering things randomly, check your cartridge. Chances are it isn't doing it's job properly. 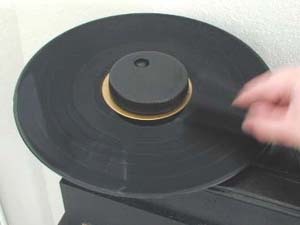 Before I begin restoring an album I always clean it using a Nitty Gritty record cleaning machine. This makes quite a difference to the over-all sound quality of the CDR. I was amazed at how much these things can improve the sound of vinyl. I highly recommend you buy one if you are serious about restoring albums. You don't really need the best one. I have a budget model and it works just fine. 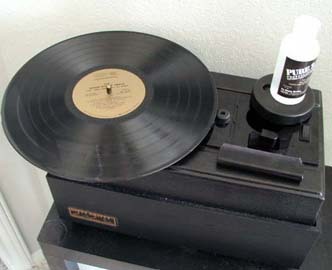 Check audioadvisor.com or garagearecords.com for record cleaning machines and cartridges. You can really spend a fortune on good software and usually it's worth it. I happen to work in the A/V field and have access to a lot of what I need...legally! There are many good packages out there and I don't have time to try all of them. Instead, I will try to point you in the right direction. Do your own thing, but be sure to try before you buy. My recording software of choice is Sound Forge by Sonic Foundry. I really like the interface and tools on this package. They also offer CD Architect which is a great way of laying down these albums on CDR. Unlike most others, it does allow you to do cross fades and you don't have to have the 2 second gap between songs. With the release of their Direct-X Noise Reduction II tools, I really don't have to venture out of the software to get the job done. This is an expensive package, however. If you just buy the CD Architect program, you do get a "light" version of Sound Forge called Sound Forge XP. It does fine for most things...just not all the bells and whistles (or noise reduction) of it's bigger brother. Another little program that is worth it's weight in gold is Sound Laundry by Algorithmix. It's lightning fast and easy to use. It does a better job on clicks and crackles than any other software I know. What's great about this package is the simplicity and the ability to hear what you are removing from the recordings before you remove it. It can de-click an entire album in about 3 minutes! There are countless other good software packages out there such as Cool Edit Pro and Dart Pro. If you have one and want to tell us about it e-mail me a report and I'll try to include it here. 1. Clean the album using a good record cleaning machine. 2. Clean the stylus on the turntable. 3. Play a section of the record into your computer recording software and check the input levels making sure they don't clip. 4. Record both sides as either 2 files or 1 long file and save them. Here's a tip...don't crank up the volume when you are recording. If there are a lot of vibrations hitting the turntable, it might adversely affect the stylus and slightly "color" the sound. 5. Name and close the file. Re-open it in the program that you use to do the noise reduction. 6. Most Direct-X programs allow you to sample what you are removing in "result" or "difference" mode. Click and pop filters have a tendency to remove fast drum hits, cymbals, and synthesizers if they are set too high. Set the levels just under the point of hearing the clicks and pops from the drums. Carefully listen to what you are removing. I always use headphones first, then the speakers. Be patient! Listen to a few minutes of the recording using the play difference mode of the software. Don't forget to turn off the difference mode so it doesn't save the result as a file (who wants 40 minutes of clicks and pops?). Here is what can happen if you are not careful. Listen to this .mp3 file of a synthesizer. The first time you hear it will be with no click and pop filter. The 2nd time it plays is with the click and pop remover in Sound Forge set at what I would consider a mild setting. The 3rd time the original file is run through Sound Laundry. Both filters alter the sound dramatically. Keep this in mind if you decide not to preview! 7. At this point, I usually open the files in Sound Forge and mute the first few seconds of the grove lead into the album. I do a very fast fade in just before the music actually starts. I play each song, and listen for defects that the noise filters didn't catch. I fix those in pencil mode by redrawing the click. I also do a fade out during the actual fade that is in each track, then mute the sections between the songs. I "fast fade" back in just before each track. 8. After I "tweak" the recordings, I create a region for each song. Sound Forge allows you to save each region as a track. I create a folder on my hard drive for each album and save the regions to each folder. 9. Open CD Architect and import all the files from that folder. Arrange the playing order and drag each clip around to add or reduce the time between tracks. Q. My software has noise reduction. How about using it? A. Good question. Tricky answer! Although I have nothing against noise reduction software, it can really mess up the sound quality if used incorrectly. This being said, I use it all the time. I am, however, experienced at it. They key to it is that you can never really get rid of all of the surface noise (not without altering the quality of the sound!). Depending on the NR software, I can usually get good results with a -10db reduction. Some of the newer algorithms from Sonic Foundry allow me to push that as high as -20db! 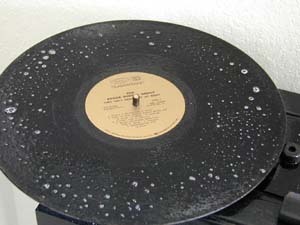 I only use NR on vinyl that has been pressed poorly or is particularly noisy and messes up the Tate. I hate to say it, but the worst albums that I have heard came from Columbia (the inventor of SQ) in the early 70's. Ouch, the quad era! I have had some albums come through here that were never open or in mint condition, but when I played them, they sounded horrible. I tried cleaning them 5 or 6 times and they still sounded bad. Upon close inspection I noticed very faint ripples in the vinyl and some very small bubbles underneath the groves. The ripples made it sound like a radio that was getting bleed over interference from a nearby station. The noise filter could not analyze it properly because it wasn't a constant sound. The click filters didn't recognize it either. Long story short...no matter what I did, it sounded awful. I got a duplicate of the same album a few months later and it was nearly as bad. Truly a bad day at the pressing plant! Q. Shouldn't you be using a better turntable? A. Yeah, I guess. I have to say in all honesty that this little table is very good and it is very quiet for a cheap machine. I like linear tables because they don't wear out the vinyl as fast and there is no "skating" involved. It will do for now. Q. 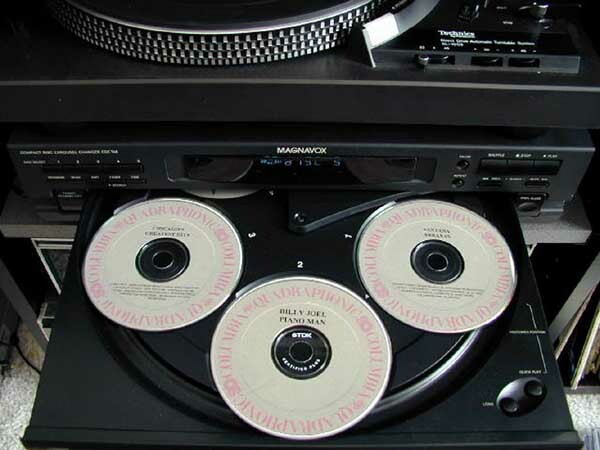 Can all CD players read CD-R discs? A. No! Most machines made in the past few years can. Some older CD players may have some problems tracking CD-R discs. Keep this in mind before committing a lot to a project. Q. Where can I learn more about recording CD's? A. Try http://www.fadden.com/cdrfaq/ for more information. Q. What about recording it to tape? A. Tape works fine if you like to record it "warts and all" and like the nice sound of hiss. There are a couple of things to keep in mind. The head alignment between cassette decks can alter dramatically. Playing a tape that was recorded in a different machine can cause all sorts of phase abnormalities that can cause errors in the decoding. Dolby levels can vary between machines causing a muddy sound. In the Tate owners manual it warns about using a source that had any noise reduction using compression/expansion. That includes DBX and Dolby S. It will make the Tate pump the sound too much. I prefer CD-R...good luck changing my mind! Q. Can matrix quad material be compressed to mp3? A. I've done some experimenting with this and so far it's worked out very well, but only at higher bit rates. I found that 320kbps works well. The standard 128kbps had a lot of degradation in the high end and it really was accented through the Tate. 320kbps sounded exactly like the original. The plus to this is you can get up to 6 albums on 1 CD for archiving. Not bad!